Firefighters work hard to take control of the Nelson bushfire at Redwood Valley Rd. All photo credit: NZDF. 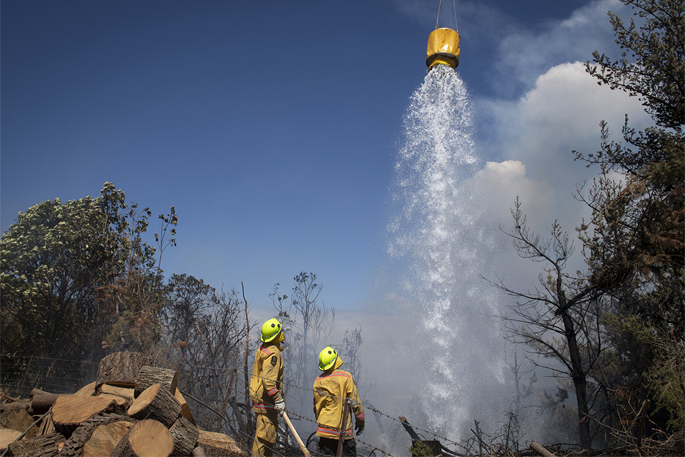 Nelson, as well as other parts of the country, are likely to see more wildfire events in future, according to fire and land science experts in the wake of Nelson’s wildfire outbreak last month. Manaaki Whenua – Landcare Research research associate Peter Williams says last month was the first time in nearly 40 years he’s seen fire-fighting choppers working both sides of Tasman Bay. “From my kitchen window, I see houses nestled closely amongst eucalypts, pines and gorse. This is not the first time there have been severe fires in this area. But when one thinks of the fires that have devastated parts of Australia, the Americas and Europe in the last few years one wonders about the role of flammable – and often exotic – trees in dry areas. Scion Rural Fire Research Group fire scientist Grant Pearce says media coverage of the major forest fire at Pigeon Valley, near Nelson, showed what a dramatic and devastating event wildfires can be. In February Grant said this year alone Nelson had seen seven days of very high, and eight days of extreme forest fire danger since the start of January, with the recent heatwave being a major contributor to this. “The very hot, dry and windy weather over the past month has had a major effect on the drying of forest fuels in particular, including slash and prunings, understorey scrub vegetation, pine needle litter on the ground and organic material in the soil, which all contribute to the amount of vegetation fuel available to burn. “These dry, elevated fuel loads contribute to easy fire ignition and spread, and to high fire intensities including crown fires that are very difficult, if not impossible to control, especially in steeper terrain often favoured for forestry plantings. Grant says modelling of potential future changes in fire danger indicates the number of severe fire weather days is likely to increase in many parts of the country. “This includes the Nelson region, where the number of days of very high and extreme forest fire danger could increase to more like 12-13 days per year on average, and maybe 20-25 days in the worst years, with climate change. NIWA meteorologist Ben Noll says the start to summer from December 2018-January 2019 was the third warmest on record for NZ. “The NZ Drought Index is reporting ‘extremely dry’ conditions in the Tasman-Nelson area, indicative of long-term dryness that began in November 2018. According to the Index, drought conditions were also reached last summer. For more fire weather details, see the NIWA-FENZ Fire Weather website.